Not to be confused with another kangaroo villager, Marcie. 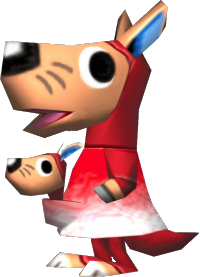 Marcy is a peppy, kangaroo villager from the Animal Crossing series. Her name originates from "marsupial," the category of mammal that kangaroos fall into. As with all kangaroos, her joey mirrors her emotions and looks. Marcy has black whiskers, a black nose, and big ears with blue on the inside of them. Marcy's initial shirt is the Sno-Cone Tee. Her eyes are big and black. Marcy appears to be wearing a red bodysuit that starts on the back of her neck. She has white feet tips and has purple hand-tips. Marcy's child has the same look as her. Marcy is a peppy villager, meaning that she will be very friendly and excitable, always acting very happy to see the player, and will often use words like "SOOO" and "Totally!" in conversation. She will not get along with snooty or cranky personalities very well. Marcy's house is beach-themed. She also has some gyroids and Tulip Set furniture. Aloha K.K. plays on her Tape Deck. "Do your homework!" "Go put on a sweater!" "Your pouch is a mess! Clean it up!" Marcy is the strictest mother around, and everybody knows it. It must be hard to be stuck in her pouch like that.